Work from Unknown Known and Templates. “My practice has evolved and is now principally focused on questioning the nature of the photograph, especially the photographic portrait, its physicality and its power of representation in the public as in the private sphere. I wish to explore the complexity and ability of the medium to deliver narratives and new meanings, depending on context and presentation, through strategies of seriality, compari- sons or decontextualisations. When a photograph is disengaged from time, space or identity, the viewer feels compelled to reconstruct the broken links between subject and context. A photo- graphic portrait shot on a featureless background, like the flat gold background of Byzantine icons, gives us only an image of a face, disconnected from the scene that existed a second before and after the release of the shutter, and is vulnerable to abstraction. Our imagination and fantasies are tantalised by the vernacular por- trait, removing us from the purity or truth of the original. By adding our person- al interpretations and punctums, we are not only reconstructing a character, but are depicting or expressing our own portrait or the portrait of someone familiar. Vernacular photography is doubly generic; by means of the common anonymity of its subject and author. Those images are therefore exposed for deconstruction; stories can be told and opinions made. Remarkable portraits are sometimes overlooked or abandoned by their makers. I am interested in giving these works a new visibility and density. I am therefore voluntarily changing the connotations of these often disregarded images in order to create new interpretations, to be connected or coupled with the found photo- graph. The point is to reveal the hidden influence and beauty of such portraits. 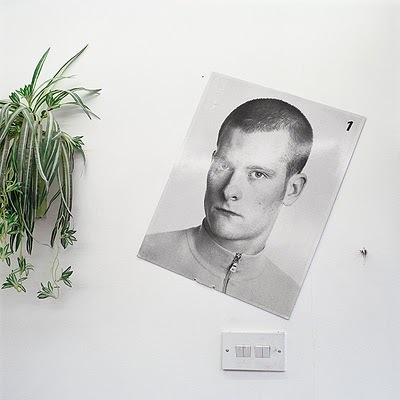 The vernacular photograph is used as an ‘average’ image, a generic and innocent base, offering the possibility of humanisation. In my work I have fabricated visual relationships between two strangers by repli- cating, through the creation of facsimiles in new photographs, the facial features, appearance or gaze of unknown portraits.The simulation, represented by the pose, and often imperceptible, is paradoxically easier to simulate than the inner truth of the portrait. I agree with Barthes who sees the process of ‘posing’ as an objec- tification: “I instantaneously make another body for myself, I transform myself into an image[…] I feel that the photograph creates my body or mortifies it, according to its caprice.” The experiment of the diptych proves that it is possible to reproduce some physicality, signs of exteriority, fake family lineage, but not the essence, the person- hood of the sitter. Therefore a generic portrait is not obviously duplicable, clone- able, it has an individuality, frame of reference and anchor in time that is unique. I am interested in the tension and emotion that can be created or revealed between two or several photographs.The face regaining a meaning, a weight not through its uniqueness, but through its juxtaposition with another face or another expression of the same face. This dyptich of Rineke Dijkstra shows the same woman, pho- tographed exactly the same way, revealing a very subtle transformation of facial appearance. The viewer unconsciously is forming a mental image of an unknown interval between two moments. Moments often crucially chosen by Dijkstra are usually post-climax, here just after having given birth and 5 months later. What remains of the family and social life without the photographic record? Are photographs essential for remembrance, are they the most powerful images we possess? They are proof of our existence, our evolution and choices. Why do we keep certain photographs and decide to discard others? In this editing process, we build up through the years our intimate memory, and construct our ideal family of beloved people and places. According to Baudrillard, we live in a simulacrum of reality, not in reality itself. It is the same with our own image, our portrait is a simulacrum of ourselves. One can say, being photographed is like the creation of a virginal likeness of ourselves, where our soul and past is not discernible.The photographic reproduction has its own life, is open to interpretation, and it is rarely that it will express the reality of the original. This reveals an intrinsic property of photography as a selective, inter- pretative filter of reality and at the same time a redemptive presenter; through our image, we can escape the weight and responsibility of our mortal condition. Christian Boltanski is a reference of an artist nourishing is work with archival imagery and using the face as the chore of its practice. He has always ‘levelled’ his faces in his photographic installations. In Menschlich, anyone could be ultimately saved, no one is judged, because everyone is unknown. This is a redemptive and compassionate piece. Innocents, victims, murderers are displayed together, and it is disturbing not to be able to differentiate between them. This is part of the point; we don’t need to. The deliberate process of alteration and blurring of the image allows the face to gain access a universal territory. Purged of its individual features, it becomes part of the collective. This alteration process allows personal identification of the face. This identification and appropriation of the face is what I am looking for to start a new piece.The ‘found’ portrait doesn’t have to be anonymous, but needs to be a potential receptacle of content by a social, historical or sentimental context I have been connected with, in some way. 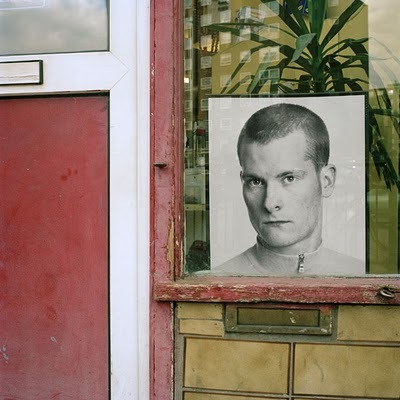 The encounter and fascination with an ‘image-face’, visible in a hair salon window acted for me as the inspiration for a new photographic series about the power of a portrait visible in a public environment, its system of representation and possible interpretations. 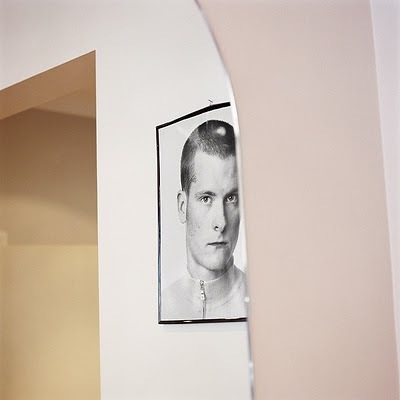 I framed the images this way to reinforce the ambiguity embed- ded in the photographs and not to reveal the location; as one notes the formal pose, it becomes clear that the portraits are in fact studio shots.We are in front of façades and masks, visible but inaccessible. These images are chosen and placed with generic intentions, but paradoxically they don’t match any fantasized beau- ty nor the standard beauty of the ‘average’ man. I started to collect the object of my fascination as I could find it in numerous places.This is not a physical fantasy but a questioning of the social and gender stereotype of a face. This photograph is offered to the customer so that he can become this image, he can identify him- self with it. I find this image seductive not for these reasons, but because in terms of pure photography it condenses what makes an ‘ideal’ portrait for me: the pose, the sobriety, the gaze. Everything is there but nothing is said. I am interested in how the same face, here one of a model, when shown in series, paradoxically loses its individual substance to become an object of consumption. At the same time its presence is reinforced by its duplication. My work in general and this piece specifically is only functioning thanks to com- parison and serial devices. It is in the tradition of a conceptual approach of artists who use photography as a language and a system, focusing on repetition, typolo- gies, recontextualisations… Even if I use some formal strategies of this tradition like frontality and neutrality, like the photobooks of Ed Ruscha who said “My pic- tures are like a collection of readymades”, the subject matter in my work, principally the face is of high importance and it is only through it that I wish to express emo- tions, let them be positive or negative. This portrait is to be seen next to the Template series. My intention is to create a generic template, following the codes and pose of the hairsalon shot, but not com- paring any physical likeness. I wanted to create a template, as blank as possible and by doing so, emphasising the uselessness and emptiness of such commercial photographs.Thomas Ruff once said: “An individual portrait is especially more suited to showing than a photographed face can have something very general, very anonymous about it.” I’m also playing with the discrepancy and ambiguity that exist in the fact that my portraits are viewed to be anonymous, unknown, mysterious or generic for the viewer and at the same time are very close to me because the models I choose are my friends and relatives. The entry 'Caroline Devries' was posted on January 11th, 2010 at 11:50 am	and is filed under french, meta-photography, picture in picture, portrait, self-referential, semi-meta. You can follow any responses to this entry through the RSS 2.0 feed. Both comments and pings are currently closed.